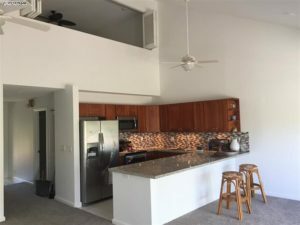 Brought to market in late January of this year, Kamaole Sands 7-409 is filled to the brim with over the top upgrades that make this unit one of the most desirable in the wholeKamaole Sands community. Located on the 4th floor with the lofted floor plan, the staircase has been moved from the center of the room and now runs up the side wall creating more usable living space. With this clever change, the 1188 sqft layout feels a lot large than what it used to be. The large lanai just off of the living room also adds more space to the unit and can easily be used as a 2nd living or outdoor entertaining area. The unit has been used primarily by the owner and their family with a few rentals interspersed, so the rental history is slim to none. 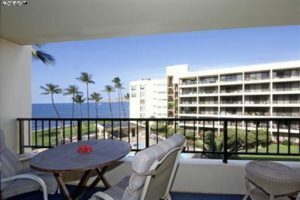 If this unit doesn’t catch your eye, stay up to date with the Kamaole Sands new listing email alert. 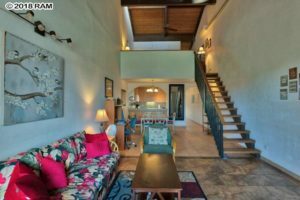 Listed in mid April of 2018, Maui Kamaole D203 is a top floor unit with the added bonus of a semi closed lofted space over the kitchen that can function as a 2nd living area, 2nd bedroom, office, or whatever you wish. Most tend to utilize it as a 2nd sleeping area for accommodating more guests; some even put a murphy bed for more flexibility. The renovations were completed to modern standards and done very well. The upgrades are just enough to add that touch of elegance, but not crazy where a high list priced must be charged to recoup the costs. 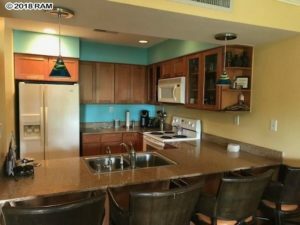 The kitchen was remodeled to offer an open concept space with the counter top serving dual purposes as a bar, informal eating area, and kitchen prep area. Remodeled just this year, the unit feels brand new with upgraded appliances and a modern backsplash that plays nicely off the new cabinets. Total specs include 2 bedrooms, 2 bathrooms, 1214 sqft, and an outdoor lanai space. Stay in touch withe Maui Kamaole market by subscribing to our new listing email alert. First brought to market in late December of last year, Sugar Beach Resort 410 is an amazing beachfront unit sitting on Maui’s longest stretch of sandy beach. Sitting within not event 50 yards of the beach, South Maui’s beachy lifestyle can be yours 24/7. Remodeled just last year, the unit has been upgraded with neat touches and kept within reason so that doesn’t over inflate list price. 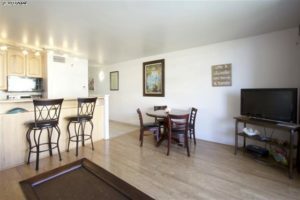 With 1 bedroom, 1 bathroom, and 613 sqft, the unit is decently spacious and complete with great complex amenities. Sugar Beach Resort is a coveted complex in the Kihei market because the price point is truly unbeatable for what you get. From its 4th floor location, the lanai offers awesome views over the ocean and beyond, it will easily be your favorite spot in the unit. 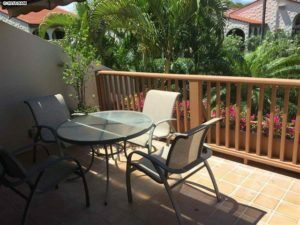 Inventory at this time is limited, so stay in touch with our Sugar Beach Resort new listing email alert. 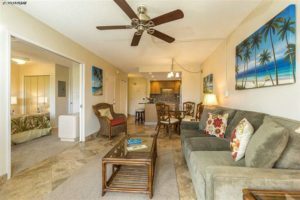 Listed at the beginning of October, don’t miss out on Maui Banyan G406, which is a completely remodeled unit with 1 bedroom, 2 bathrooms, and 650 sqft of interior living space. Sitting about 100 yards across the street from Kamaole Beach II, Kihei’s best beach lifestyle awaits! With tile floors in the main living area, cleaning is a breeze and any sand tracked into the unit can be easily wiped up. With a large lanai just off of the living area, it offers floor to ceiling doors for plenty of natural light. 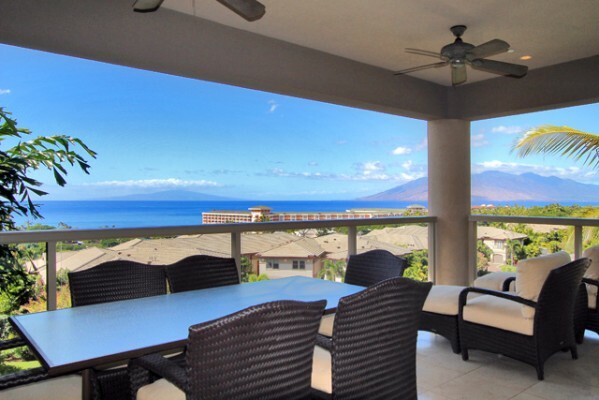 The lanai is the ideal place for catching those famous South Maui sunsets. A big plus of the unit is its ability to be rented out as a short term rental unit. A maintenance fee of $530/month is quite modest considering it includes: basic cable, water, trash, wi-fi, general liability insurance, and common area maintenance. Maui Banyan amenities include 2 pools/spas, 2 BBQ areas, tennis court, covered parking, and 24-hour security. Located within walking distance of Kihei’s favorite restaurants, shops and beaches, this property is adored by its annual returning guests. Stay up to date with Maui Banyan new listing email alerts. 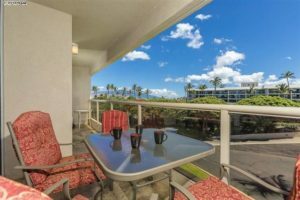 Listed in early March, Hale Kanani 1-102 is a spacious 1st floor 3 bedroom, 2 bathroom, and 929 sqft unit complete with an outdoor lanai that opens up onto a common green area. The units here cannot be rented out on a short term basis, so this is ideal for 1st time buyers or investors looking for steady rental income vs the uncertainty of short term rentals. Upgraded with hardwood floors, it makes for maintenance and clean up if any sand is tracked indoors. 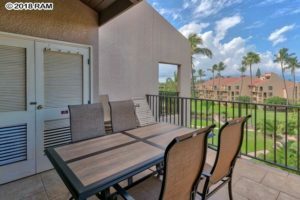 Taking into account the unit offers 3 bedrooms in attractive price point, the condo’s monthly maintenance of $550 is very modest compared to some other Kihei condos for sale. The Hale Kanani complex is on the more intimate side and only completed a little over a decade ago. The main draw of the community is its close proximity to the beach. Don’t miss out on a property by subscribing to our Hale Kanani new email listing alert. While 116 Kihei condos for sale sounds like a lot, it is really not when compared to other times of the year, inventory is down as much as 20-30%. In terms of price/sqft, buyer should expect anywhere from $200/sqft on the low end and as as much as about $2000/sqft for a high end unit. 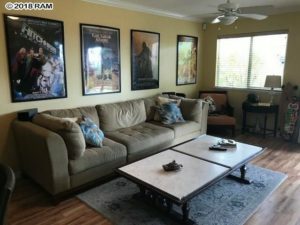 With new inventory coming to market weekly, don’t miss your chance on your completing your Maui dream by staying up to date with our Kihei condos new listing alert.